A blue Cypriot door, the colour of the sea, the colour of welcome. 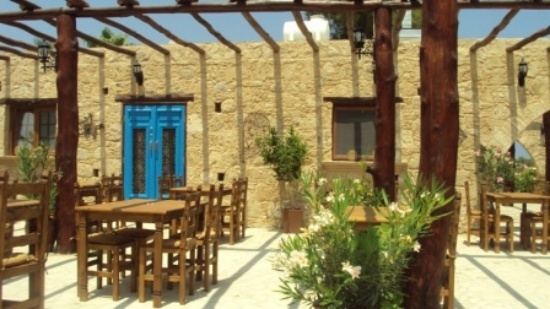 The Blue Door Restaurant, the name of a fairly new restaurant in Alsancak in a revamped stone house. 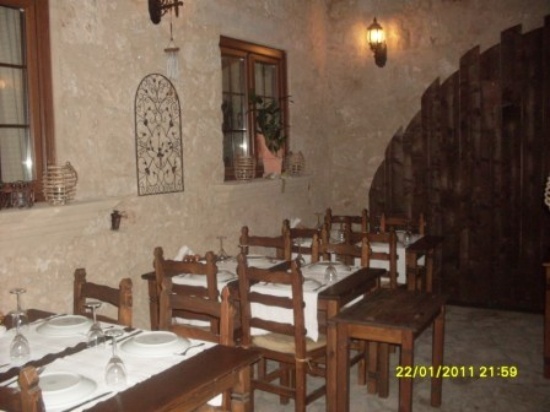 It was taken utmost care to keep the house as Cypriot as possible in all details with bamboo ceilings and wooden beams across them, with arches around the house and inside, Cypriot marble floors, also the furniture, curtains, lighting and decoration are truly Cypriot. The place was opened in June 2010 as a Cypriot/German enterprise, after many months of restoration. The mayor of Alsancak, Dr. Atakara, came to cut the ribbon, very proudly so. 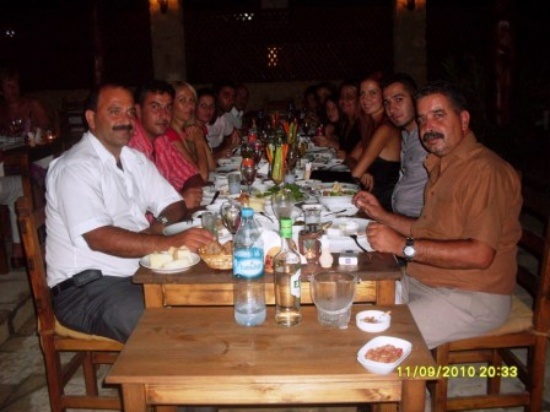 It is certainly a new attraction, not only to Alsancak. 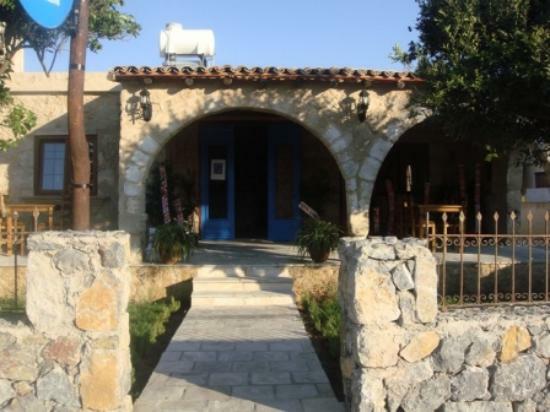 The German/Cypriot owners have been working in gastronomy for all their life, had their own business, and when they came here the plan to open a restaurant came quite naturally. 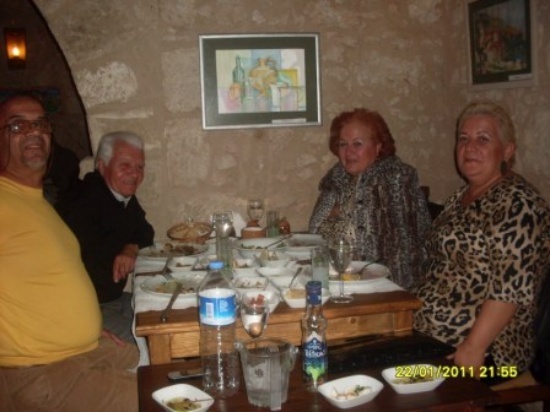 The couple had one day decided to come to live here to learn more about their heritage… or half of their heritage and luckily met Nihat Deveci after the extensively renovated restaurant was opened; Nihat now runs the place. 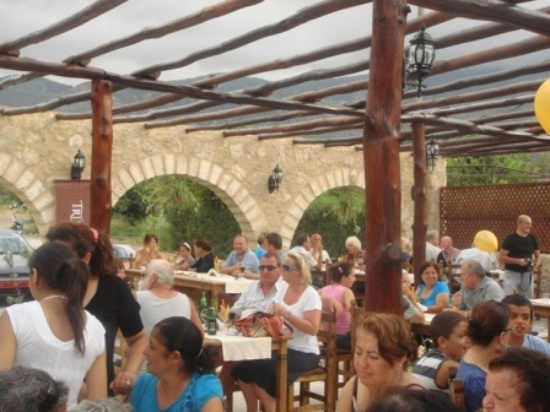 In this way, German Knowhow and correctness and Cypriot knowledge about traditions, food and Cypriot hospitality came together to establish a true Cypriot atmosphere. The news of a new restaurant spreads fast and so in no time the Blue Door Restaurant was frequented well from the very beginning. We went there twice, both in the winter months, and we were immediately enveloped by the friendly atmosphere, the good lighting and the coziness of the restaurant. A fire was burning in the open fire place. Nihat Deveci welcomed us and showed us around. There are several rooms divided by arches, with tables for four which can also be put together for bigger parties. In one big room, on the enclosed and covered terrace, smokers feel at home, with radiators to keep them warm as on top of the walls are openings for the fumes to escape. I am sure this will keep smokers happy being regarded an unwelcome minority nowadays. All the walls of the restaurant are decorated with paintings by a local artist. 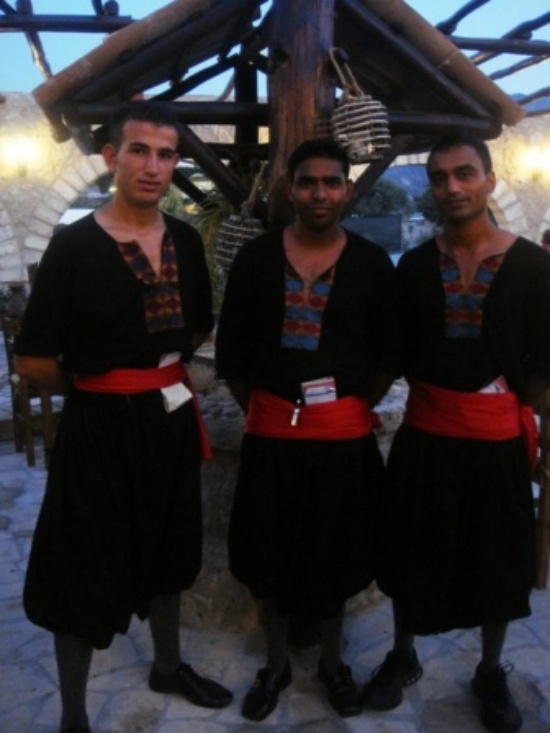 The staff in traditional costumes is exceptionally well trained, speaking Turkish and English, and what I personally appreciate is an attentive service but not being constantly stared at during the meal. From the true Cypriot menu we chose one mixed kebab and a rib-eye steak and both dishes were delightful, especially the meat was done to the point, the French fries home-made and the salad was fresh and delicate. There is the traditional Full Kebab with 20 cold and 6 warm mezes, main course, traditional dessert, fresh fruit and Turkish coffee for TL 35 and à la carte dishes, meat and fish of the day, all at reasonable prices. The guest rooms inside can seat 100 guests and in the warm season the garden in the back of the house can take up 140 people. 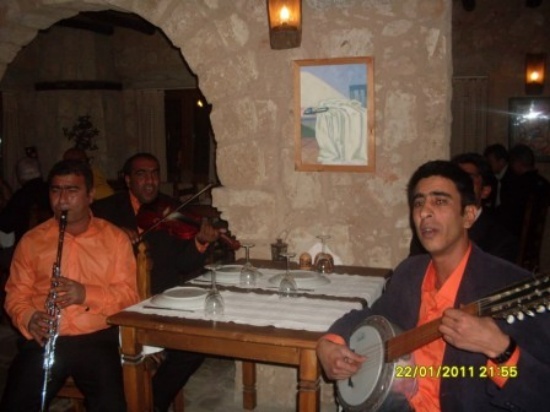 Twice a week a group of musicians play traditional music known as Fasil music on traditional instruments. 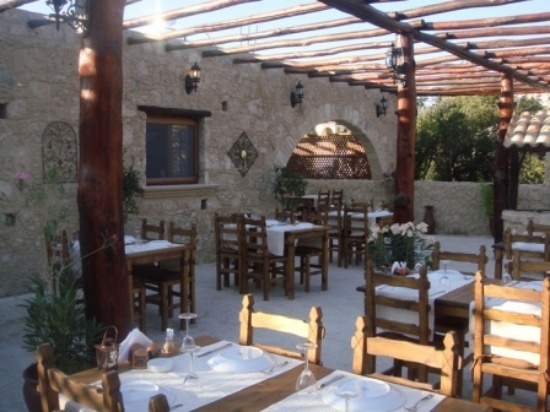 The restaurant is open daily except Sundays from 18.00 to 24.00 hrs and as from April 2011 also during the day from 12.00 to 24.00 hrs. What more can I tell you, you must come and see for yourself. 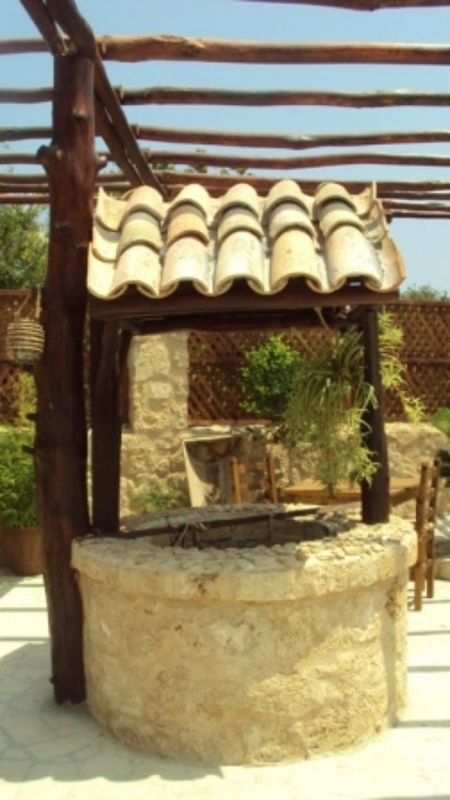 The Cypriots come here because they feel at home and the foreign community because they are charmed by the Cypriot atmosphere. For table reservations, group arrangements or other information, please call 0542 850 6061, 0533 861 7448 and for English 0533 827 1188. When you come from Girne turn off at the Golden Lady towards Alsancak and just after some hundred meters on the left side, right in front of Atakara Supermarket, is the Blue Door Restaurant with a big parking area in the back.